Cleveland may have the worst overall quarterback play in the history of the league. Browns fans Tony and Jill Timoteo decided to troll their favorite team and create a graveyard for the countless number of quarterbacks who come and died playing for the sometimes dismal franchise. If you look closely, you may find your favorite college quarterback who came to Cleveland and never flourished. 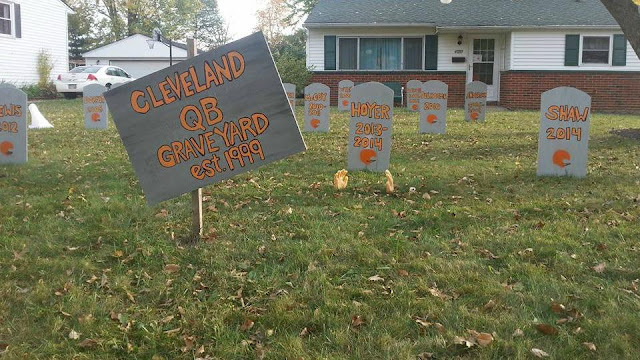 Each of the 22 headstones feature the name and dates of the player’s time as the Cleveland quarterback, with the most recent additions being 2014 first-round pick Johnny Manziel, and current starter Josh McCown, whose brother Luke also appears on the lawn.